Don’t leave pets outdoors when the temperature drops. During walks, short-haired dogs may feel more comfortable wearing a sweater. No matter what the temperature is, windchill can threaten a pet’s life. Pets are sensitive to severe cold and are at risk for frostbite and hypothermia during extreme cold snaps. 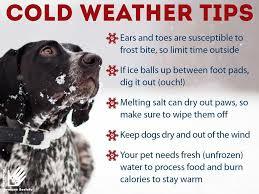 Exposed skin on noses, ears and paw pads can quickly freeze and suffer permanent damage. Share to keep animals warm and safe! If there are outdoor cats, either owned pets or community cats (ferals, who are scared of people, and strays, who are lost or abandoned pets) in your area, remember that they need protection from the elements as well as food and water. It’s easy to give them a hand. Warm engines in parked cars attract cats and small wildlife, who may crawl up under the hood. To avoid injuring any hidden animals, bang on your car’s hood to scare them away before starting your engine. Be sure your horses have access to a barn or a three-sided run-in so they can escape the wind and cold. While not all horses will need to be blanketed, blankets will help horses keep warm and dry, especially if there is any rain or snow. If you’ve body-clipped your horses, keep them blanketed throughout the winter. Give your horses access to unfrozen water at all times. You can use heated buckets or water heaters/deicers to make sure the water doesn’t freeze. Feed your horses more forage—unlimited amounts, if possible—during extreme cold. This will help your horses create heat and regulate their body temperatures.